Last night while working with Bugaboo on his physical therapy skills, Bubby was in the room "helping" and encouraging his little brother. "C'mon Bugaboo. Let's go. Come get it." Tonight he continued to do that. Then at one point I had Bugaboo working working on staying in a hands and knees position and I simply just prayed aloud, "Dear Jesus, Help Bugaboo to crawl." I didn't close my eyes or anything - just said that and kept working. I look over a few seconds later and Bubby had his hands folded just like he does at dinner. He then said, "Help Bugaboo crawl." Just wanted to remember this moment. That is so sweet. Child-like faith :) I'm praying for Bugaboo too! This made me cry! 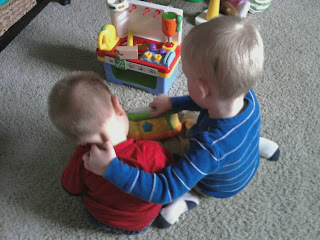 I hope Bubby and Bugaboo are always good buddies.